Is that a Jackson Pollock painting? Well I’m flattered, but the answer is no. Although I’ve always been known to have incredible creative talent. See childhood refrigerator. This masterpiece is in fact a succulent, low-sodium rack of BBQ pork ribs that I made in a flash (cooking confession: the preparation time was about 10 minutes, the effortless cooking time was an hour and a half, and cleanup took only ten minutes as well) in honor of the 49ers opening day. In yet another tale of low-sodiu tailgating, I knew I wanted something juicy, smokey, and manly to bite into before the official coin was tossed. And while football was made for grilling, I also knew that I didn’t want to leave the comfort of my kitchen in order to make this hunky dish. Nor did I want to spend hours on it. I may love to eat complex tasting food, but I also love having time and energy to enjoy it. 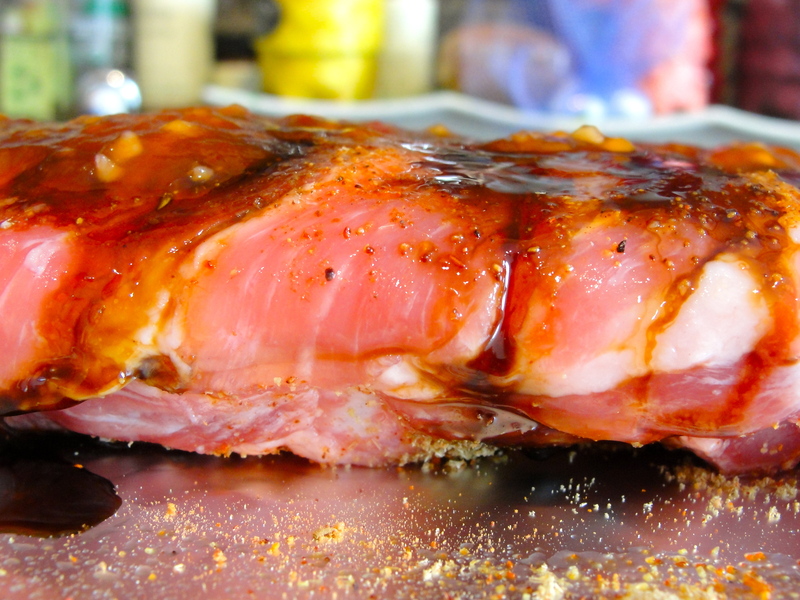 So I came up with this simple playbook: First, give the ribs a good rub-down. I mean real good. 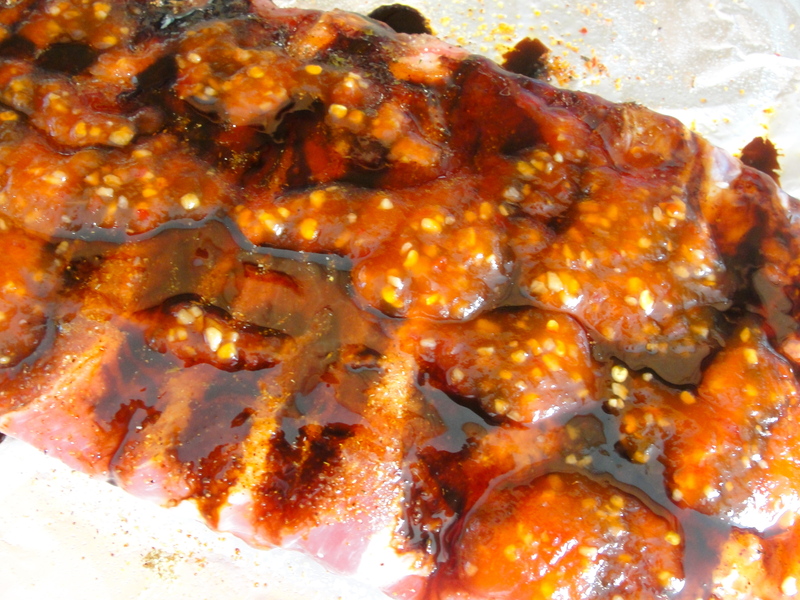 Get your hands dirty and massage those baby-backs with a hearty blend of spices. I used cumin, cayenne, pepper, smoked paprika, a little brown sugar, and some garlic powder. Then, because I was low on ingredients and even lower on time, I made a free-form BBQ sauce, pouring molasses, pomegranate molasses, and a few drizzles of the Ginger People’s Sweet Ginger Chili sauce on top. I wrapped the whole ting in foil, threw it on a cookie sheet, and into the oven(which was on 400), where it sizzled and steamed for an hour and a half. The result? Meat that literally fell right off the bone. Touchdown. 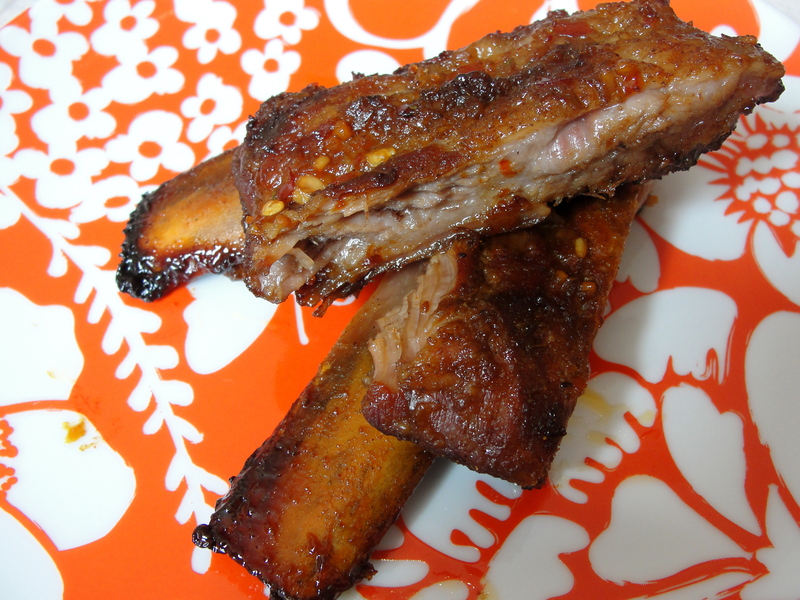 So whether your going to a game or watching the action from your couch, these ribs will satisfy your hunger. And the recipe is so simple, and requires so little of your attention, that you won’t miss a sack, an interception, or any other game-changing play in order to make them. Kick off and chow on. I am drooling. Seriously, ribs are one of my hands-down faves. Of all time. EVER. PS: Sorry SG, but GOooOOOo E-A-G-L-E-S!!!!!!! Hi Sodium Girl. Is that Ginger People’s Sweet Ginger Chile for sale in any store around the Bay Area or is it something that must be ordered online? Sounds like a good thing to have in the pantry.